Roy Hutchins leads a host of stars to perform Heathcote Williams’ epic poem ‘The Poetry Army’. After months of hearing politicians touting the party line – it’s time to hear the words that have really changed the world. Where better to be on Election Night than celebrating the fearless voices past and present that have stood up against tyranny and offered lasting hope and vision? 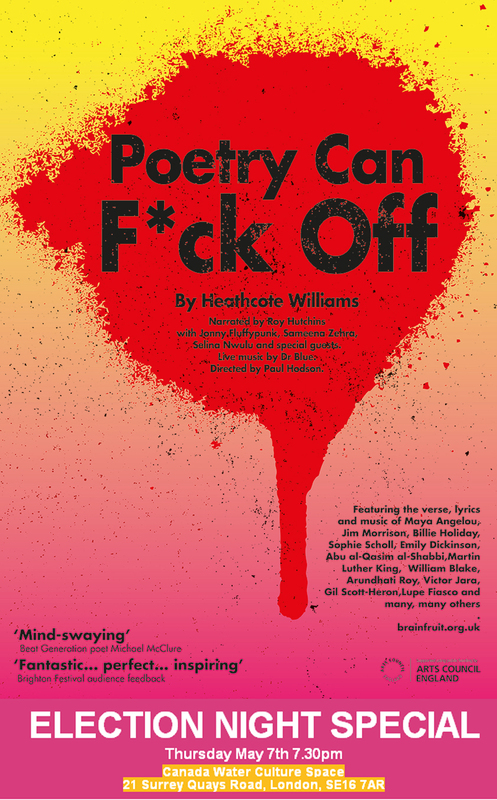 ‘POETRY CAN F*CK OFF’ is an hour-long show version of Heathcote Williams’ latest epic poem ‘The Poetry Army’- the history of poetry’s involvement with, and influence on, revolution and radical dissent – from Ghandi reciting Shelley at mass independence rallies in India to hip-hop crews on the streets at G8 summits. Special guest John Crow for one night only! All this – plus our Poetry Army Stop-the-Stump-Speech-Soapbox- Special: an all-comers invitation to recite and share the verse, lyrics and songs that have changed your world. let’s make election night 2015 one to remember!